We Are Going to Be Lucky tells the story of a first-generation Jewish American couple separated by war, captured in their own words. Lenny and Diana Miller were married just one year before America entered World War II. Deeply committed to social justice and bonded by love, both vowed to write to one another daily after Lenny enlisted in 1943. As Lenny made his way through basic training in Mississippi to the beaches of Normandy and eventually to the Battle of the Bulge, Diana struggled financially, giving up her job as a machinist to become a mother. Their contributions to the war effort--Lenny's crucial missions as an Army scout and Diana's work in the Brooklyn Navy Yard--are the backdrop to their daily correspondence, including insightful discussions of democracy, politics, and economic hardship. Faced with grueling conditions overseas, Lenny managed to preserve every letter his wife sent, mailing them back to her for safekeeping. 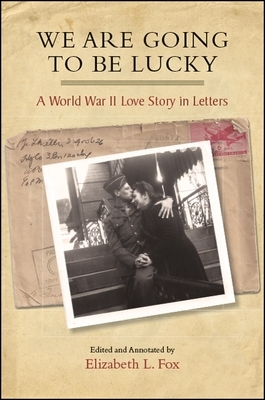 The couple's extraordinary letters, preserved in their entirety, reveal and reflect the excruciating personal sacrifices endured by both soldiers at war and their young families back home. After decades of gathering dust, their words have been carefully transcribed and thoughtfully edited and annotated by Elizabeth L. Fox, Lenny and Diana's daughter. Elizabeth L. Fox has served for more than twenty years in a leadership role on the National Board of Hadassah, where her responsibilities include writing, training, and public speaking. She has a BA in history from the City College of New York and an MA in vocational rehabilitation counseling from New York University. She lives in Boulder, Colorado.